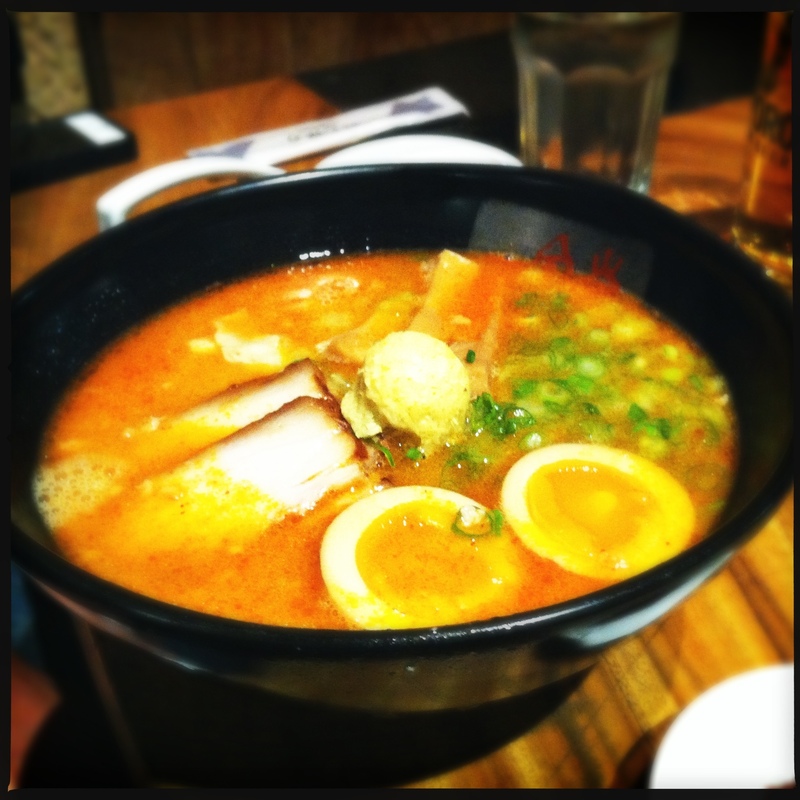 Ippudo | Oh No! Not Another NYC Food Blog! I had the Kasane Black – Authentic Kasane Tonkotsu (pork) noodles topped w pork loin chashu, cabbage, sesame kikurage mushrooms, red pickled ginger, naruto, scallions & fragrant black garlic oil. I added Nitamago (seasoned salt boiled egg). This dish was fabulous. The taste was delicate, deep, and robust all at the same time. I ate every bit, drank all the broth, and was sad I had no more room for Kae-dama (a second helping of noodles). My egg was a nice touch, and no added spice was needed – the black garlic was too interesting a flavor to risk drowning it. Get anything on the menu with the sesame kikurage mushrooms – they are lovely little flavor bombs. Soy bean paste flavored noodles in the original “Tonkotsu” (pork) based soup with pork chashu, cabbage, menma, ginger, and scallions. 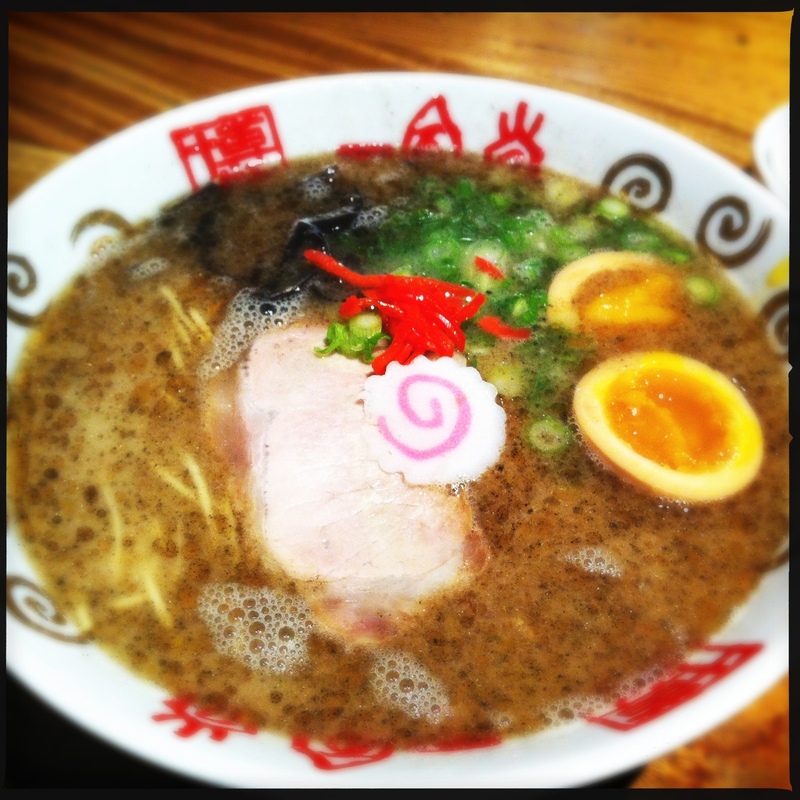 He also added Nitamago (seasoned salt boiled egg) and Bakudan (Ippudo original spicy paste). This dish was also fabulous. Rich, deep, complex & wholly satisfying. The spice was a nice addition here – that paste is really a standout in the world of spice additions. 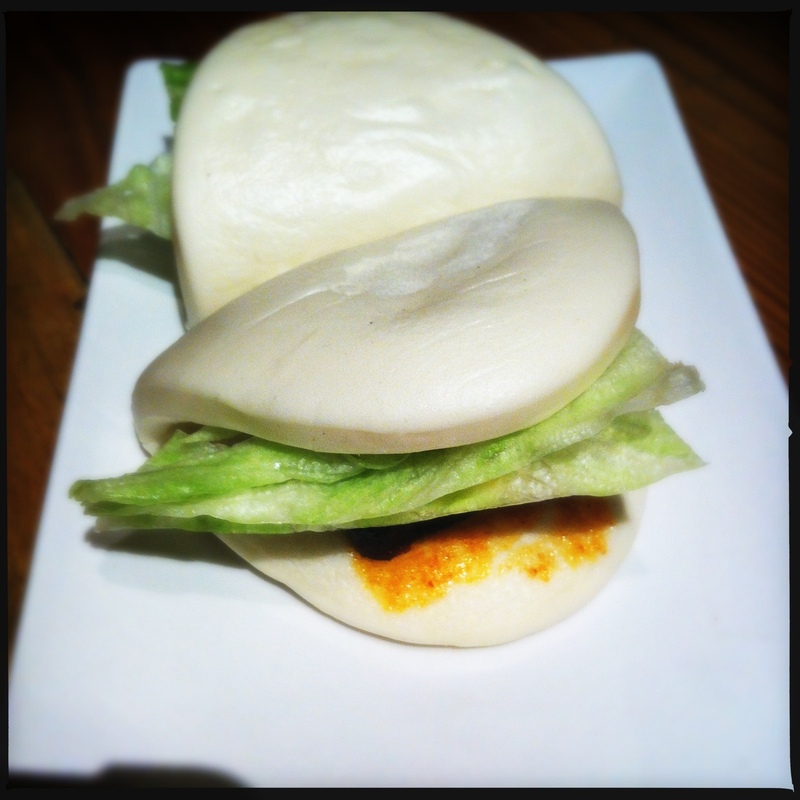 We split the Hirata Buns (pork) – Steamed buns with pork & spicy mayo bun sauce. A great way to start the meal, but Momofuku’s are just a bit better. Overall our meal was near perfect – not a note missed or a taste out of whack. Words are falling short when describing just how good the broth here is. Pure comfort – rich, deeply complex, delicately balanced – a balm for the soul. For the expertise used in preparing your food, the price is beyond fair. ($15-$16 per bowl + $2-$4 per addition). Sure, you can get a decent bowl of noodles for half the price, but this is something better. Whole. Other. Level. 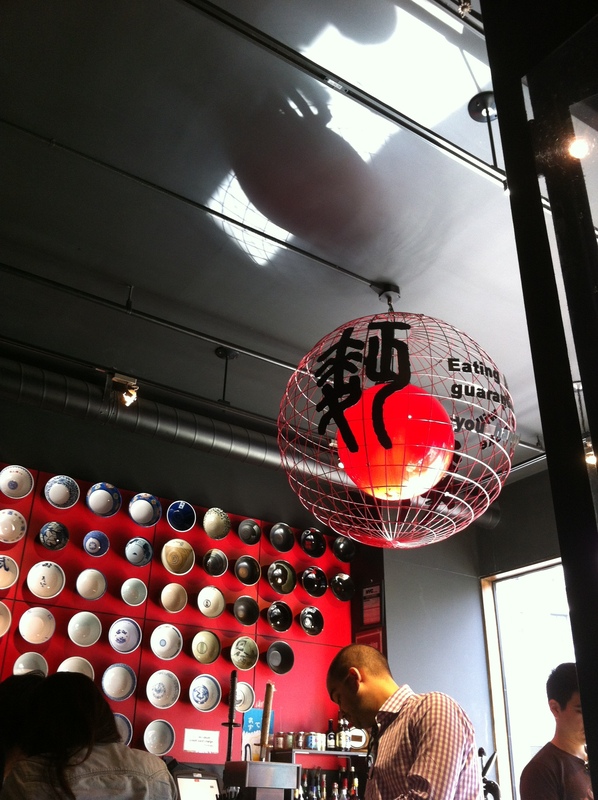 Ippudo has a great vibe – young, boisterous, open – and the Beasties (among other great bands) in the sound system. Seating is at large communal tables – not the place to bring small children or strollers. The decor is modern and minimal, yet layered and very interesting. If we lived next door, my DH would happily let it make us fat (and I don’t think I could put up much of a fight). DH is calling this his best NY meal ever. This includes WD~50, local & seasonal up the wazoo, celebrity chef vehicles, Beard Award winners and noodles from culinary luminaries. I would say for noodles it is the best – I just can’t put it over WD~50s Eggs Benedict — I dreamed of that dish for over a year and half and planned a vacation around it before we lived here (it lived up to expectations and then some — unfortunately, WD~50 has overhauled their menu since — understandable, but sad). Ippudo can’t help but be a 5 out of 5. Run, don’t walk. Wait in a ridiculously long line if you have to (and you might – lines are often crazy, though we lucked into a 15 minute wait on a Sunday late afternoon)- it is worth it.